GOVERNMENTS, POLITICIANS and ideologies may come and go in Latin America, but the Catholic church seems to outlast them all, despite the problems it has suffered over clerical-abuse scandals and the rise of rival creeds. So, faced with political and economic meltdown in an overwhelmingly Catholic country, Venezuela, how is the Holy See responding? In a very ambivalent way, some might say. The country’s bishops have been trenchant in their opposition to the repression and disastrous economic policies practised by Nicolás Maduro, the leftist president. Earlier this month, they called his re-election illegitimate, and this week they expressed their backing for the protests sweeping the country. They described the National Assembly, whose leader Juan Guaidó has declared himself interim president, as the only legitimate organ of popular sovereignty. The prelates joined Venezuela’s legislators in demanding that January 23rd should be a starting-point for democratic change in the country, just as it was in 1958 when a dictatorship was overthrown. Concerns that Pope Francis might be giving Mr Maduro too much slack have been running high since at least October 2016 when the Venezuelan leader secured a last-minute meeting at the Vatican, on a trip back from the Middle East, and used the encounter to shore up his own image back home. Conservative critics see Francis, who was chastened by the experience of living under a military dictatorship in his Argentine homeland, as someone who is quicker to denounce right-wing despots than left-wing ones, and who harbours a soft spot for anyone who claims to champion the interests of the global south against the economic might of the north. But others have argued that in a number of ways, Francis has quietly given heart to the opposition. They note that the country’s most eminent prelate, Baltazar Enrique Porras Cardozo, is a personal friend of the pontiff who was elevated to the rank of cardinal in 2016 and took administrative responsibility for the all-important archdiocese of Caracas a few months ago. The newish cardinal is described as a combative, in-the-trenches character by people who know him, and his rapport with Francis, going back to Latin American bishops’ conferences over many years, creates a useful channel of communication between Francis and the country’s unhappy prelates. There are several other channels. The Vatican’s secretary of state, Cardinal Pietro Parolin, was serving in Venezuela before his appointment, and his deputy is Venezuelan. The Superior-General of the Jesuit order, Father Arturo Sosa, is also from that country. So there is no shortage of expertise on Venezuela at the highest levels of the Holy See. On arrival in Panama, Pope Francis continued his habit of avoiding personal attacks on the Venezuelan leader, but he did say something that could be interpreted as a rather subtle challenge. The pontiff stressed Panama’s central place in the vision of Spanish America’s anti-colonial hero, Simón Bolívar, who hoped for a “Patria Grande”, or greater homeland, based on amity, freedom and respect for diversity across the continent. According to Austen Ivereigh, a papal biographer, this seemed like a veiled but unmistakable challenge to Venezuela’s hard-leftist leaders, who claim that their own style of “revolutionary” governance reflects the spirit of Bolívar. As political events gather pace in Venezuela, the time for veiled references may soon be over, and the Holy See may have to speak out more directly. 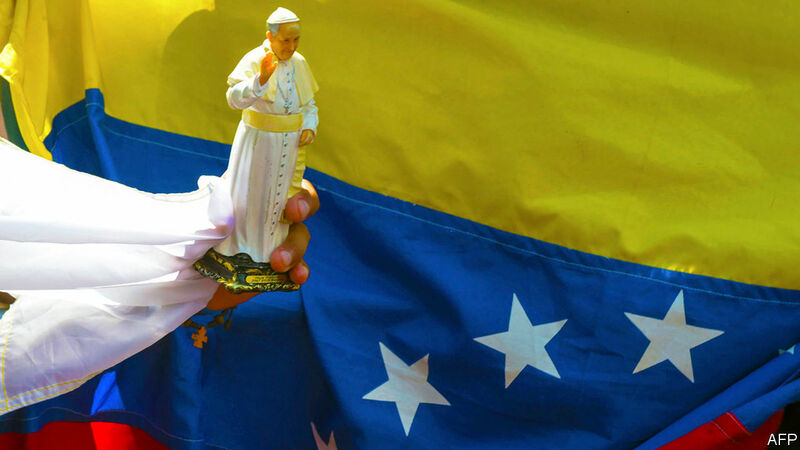 As of now, the Vatican’s calculation is that by speaking in general terms of the need to alleviate suffering, it is increasing the chance that political transition in Venezuela will be peaceful rather violent and chaotic.